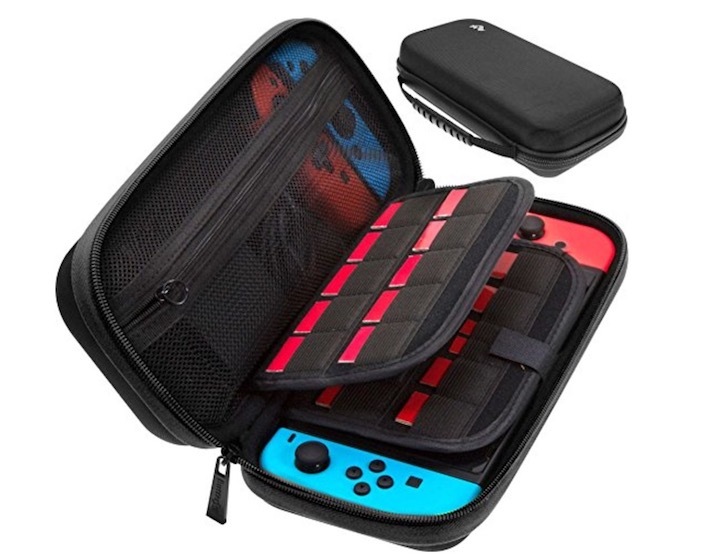 This is one of the best travel cases that you can buy for your Nintendo Switch. The case has a hard shell structure which will protect your Switch from damages in the event of drops and falls. 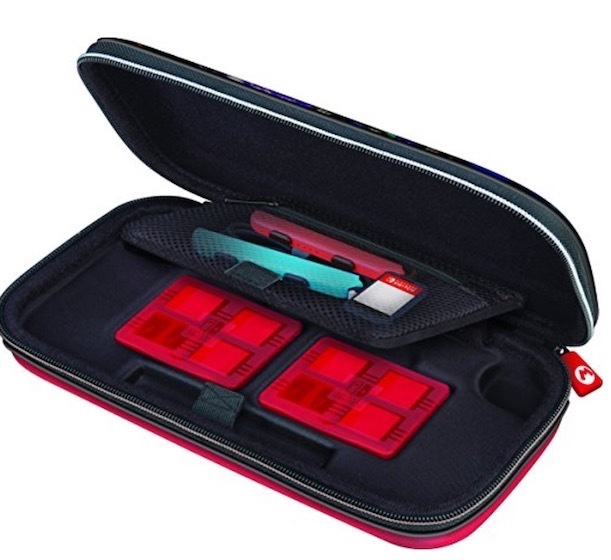 The inside of the case has a padded divider which protects the Switch’s display from getting scratched. The case also comes with two game card cases (each can hold four) and a built-in zippered mesh pocket which can hold extra Game Cards. It also comes with two Micro SD card holders each of which can hold two separate cards. This means that you are free to carry your games whichever way you like. The case also comes in various colours including black, blue, red, and more. 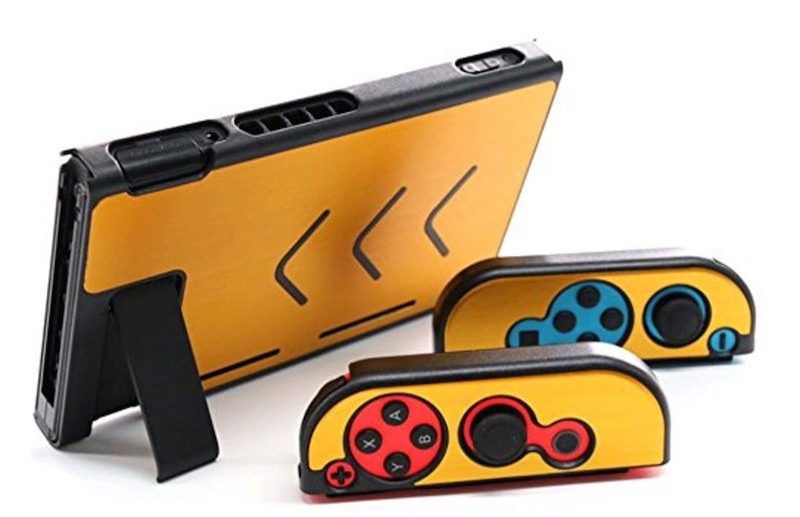 As I said earlier, this is one of the best traveler cases that you can buy for your Switch. This is also a hard shell carrying case just like the previous one. The outer hard shell is there to protect your Switch from sustaining any damage while carrying it while the inner layer is lined with soft fabric material to prevent any scratches or scuffs. The case also brings a large zippered mesh pocket which can easily store extra Joy-Cons and the Switch’s power adapter. The case makers have given a lot of attention to details here. The zipper heads are made of nylon (and not metal) to protect your Switch from scratching. Also, just like the first case on this list, it also comes with built-in game card holders which can store 20 game cards. However, it does not provide a separate space for your SD Cards, but, they can be easily stored in the game card slots. Apart from that, I really don’t have any complaint with this case. A carrying case is needed when you are protecting your Switch from damages occurring during travel, but what about it when you are using it? Obviously, you cannot use your Switch while it is inside a case, you will need to take it out. In such scenarios, a protective case is what you need, and this offering from Mumba is a pretty good one. 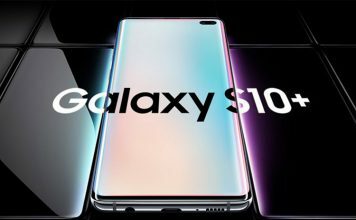 The outer layer of the case is made of hard polycarbonate material while the inner layer is lined with a soft TPU material. The combo protects your Switch by absorbing the impact shocks. The case also has an ergonomic grip handle which will reduce the chances of drops in the first place. 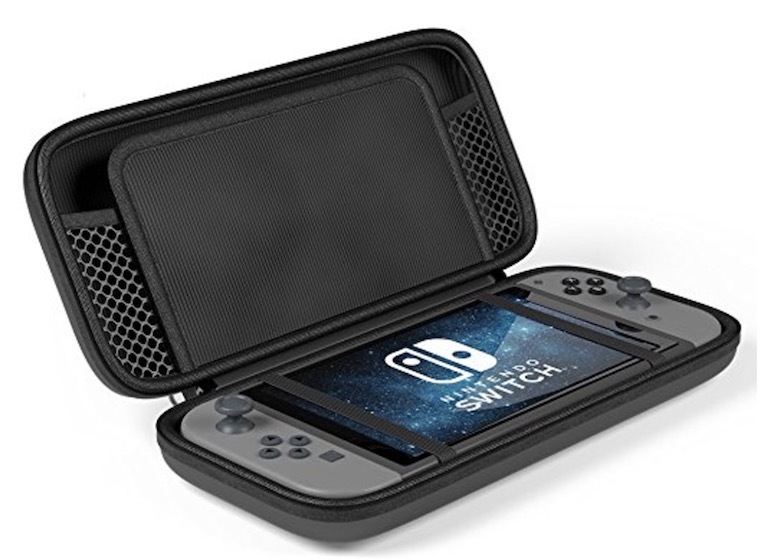 If you are looking for a Nintendo Switch case which can protect it while in use, this is one of the best that you can get. 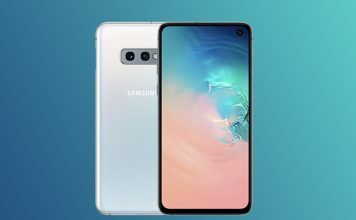 If you are a fan of clear cases, you are going to love this one. The case is made of transparent TPU material and is very flexible and soft to touch. This means that this case will only be able to protect your switch from minor drops and scratches and scuffs. However, this tradeoff also comes with a benefit. The case just like the Switch sports a 3-part design meaning you get separate cases for your console and Joy-Cons. So, you don’t lose the flexibility of Switch. Although it’s a flexible case, it has strengthened corners to enhance the protection. However, even if that was not the case, I love this case just for the fact that it is as versatile as the Switch. This case by Kungber is also a clear case but with a hard back. This means that it is not flexible as the previous ones and should provide more protection. Although it’s a hard back case, it still lets you detach the Joy-Con without the need of taking the case off. The case is ultra-thin with strengthened edges to provide maximum protection without adding much bulk. 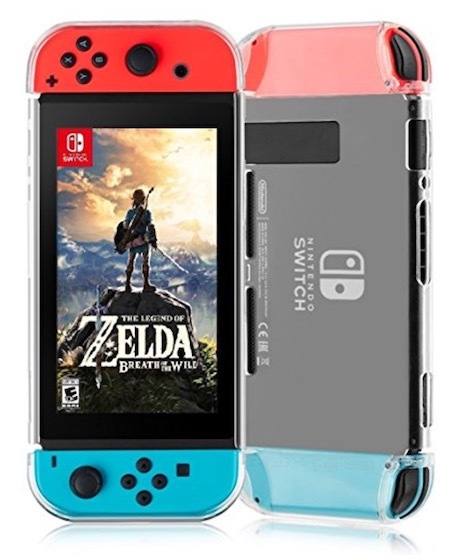 The best part about this case is that not only protects the back of the Switch console and Joy-Cons, it also protects the front portion of the Joy-Cons. 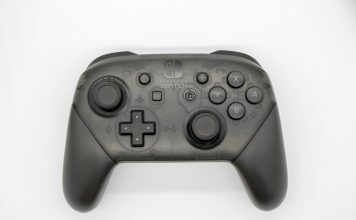 The front has precision cut outs for the buttons and it doesn’t hamper Joy-Cons’ usability in any way. 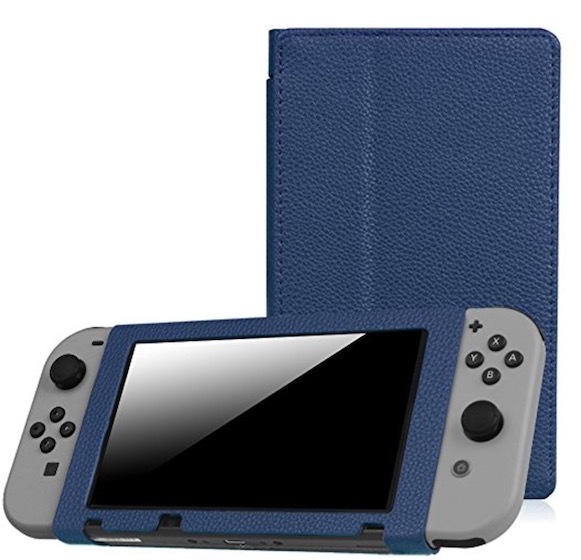 Without a doubt, this is one of the best protective cases you can get for your Switch. This is yet another great traveling case for your Nintendo Switch. It has a semi-hard outer shell which is good at absorbing shock waves. The interior is lined with soft cloth material to prevent any scratches. 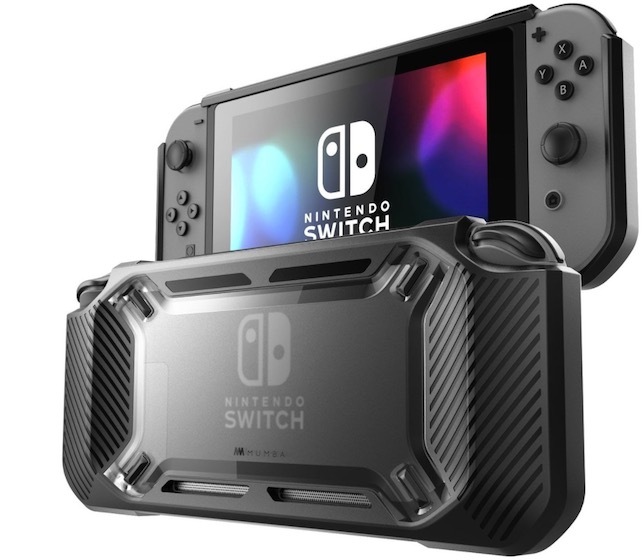 The case also packs a large zippered mesh pocket which provides secure storage for accessories like charging cable, slim power bank, ear buds, and extra Joy-Cons. It also comes with built-in storage for both game cards and SD Cards. Soft flaps have been added to protect the Switch’s display from getting scratched. The best part about this case is that although it packs so much functionality, it is very cost effective. As such, this provides good value for your money. Fintie protective case for Nintendo Switch is a multi purpose case which not only protects your Switch, but also sports a built-in stand and flip cover. The case is made of PU leather which is soft to touch and easy on the hands. The flip cover is very versatile. Apart from magnetically attaching to the front and protecting the Switch’s screen, it also folds back and acts as a stand. We all know that Switch’s built-in kick stand is probably its weakest point. The case solves this problem by including a kick-stand of its own. The case holds the switch in place by using two fastener straps. This makes it really easy to install and remove the case when you need to. It comes in multiple solid colours and patterns allowing you to choose your own look. 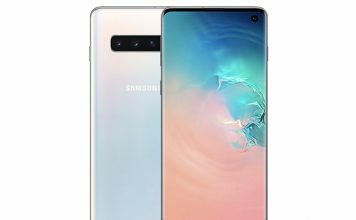 I am a little bit concerned about the drop protection that it can offer, but apart from that, the case hits all the check marks and then some. This one is another great crystal clear hard back case for your Nintendo Switch. The case sports an ergonomic, ultra-thin, and ultra-light design. Just like the Kungber case mentioned above, it completely protects the Joy-Cons by covering it from all sides. It also follows the 3 segment design allowing you to detach the Joy-Cons without removing the case. 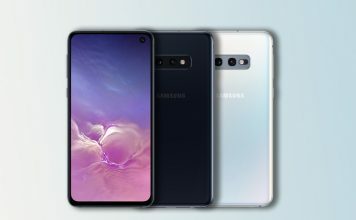 However, what sets apart this case from the others is the fact that it also comes with tempered glass screen protector. The tempered glass ensures that the Switch’s display remains free from scratches and scuffs. The whole case has an anti-fingerprint coating which is always a plus. If you are thinking of buying a case and a tempered glass separately for your switch, this can really save you some money without making any compromises. We already looked at a Mumba case which provides excellent protection to Nintendo Switch. However, that protection also comes with a lot of bulk. If you want similar protection without adding that much bulk, look at this slim-fit series case from Mumba. The case sports a transparent back and is made from a scratch resistant material which prevents discolouration and daily scratches. It comes with wrap-around bumpers which protect the Switch from minor falls and drops. 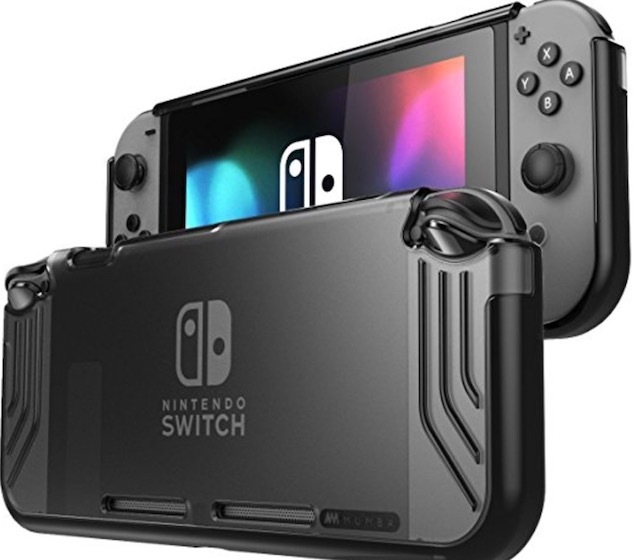 It also incorporates skid-proof soft TPU bumpers and handle-grips to protect your Switch from sliding off a surface or from your hands. This is a really good slim case which provides ample protection to your switch. 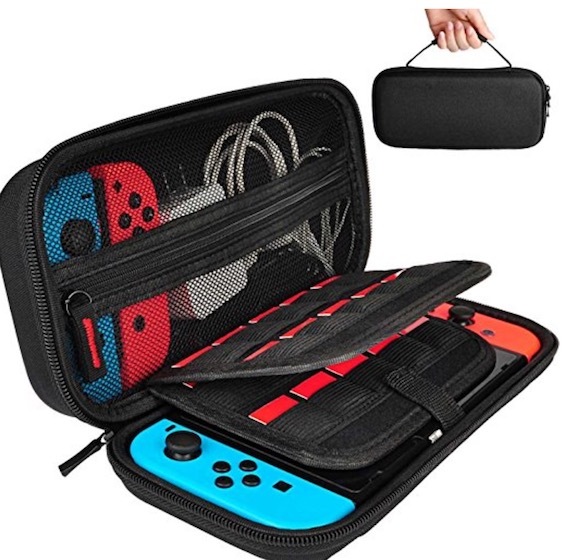 Maxboost Nintendo Switch Travel Case is another great travel case that you can buy for your Switch. It has a durable hard-shell case which protects your Switch from bumps and scrapes. It also has all the usual features which we have seen earlier including a built-in mesh pocket, storage for game cards, and a soft padded divider to protect your Switch from scratches and scuffs. However, there is no separate storage for SD Cards here. Also, the mesh pocket is open and doesn’t have a zipper. But, the company gives you a lifetime warranty to protect you against damages and defects. It is nothing which we didn’t see before, but still, a really good option which you can explore before buying your case. 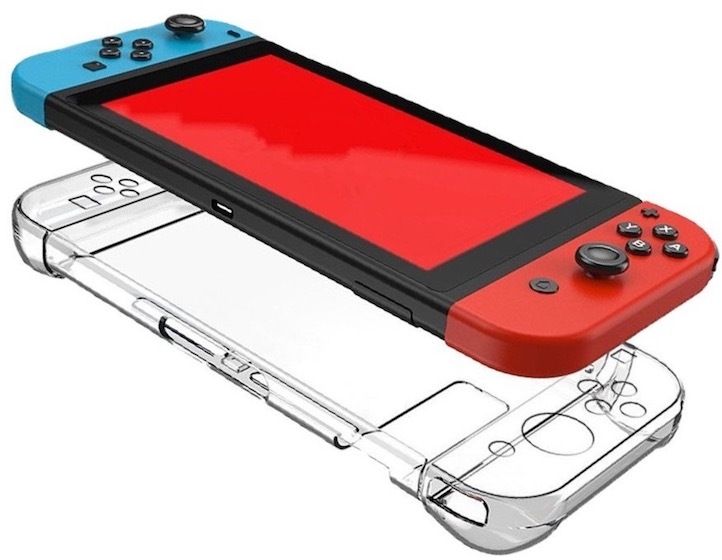 This one is also a good clear hard back case for your Switch. The case is made with high-quality polycarbonate (PC) material and is ultra-thin, lightweight, and resistant to normal impacts. 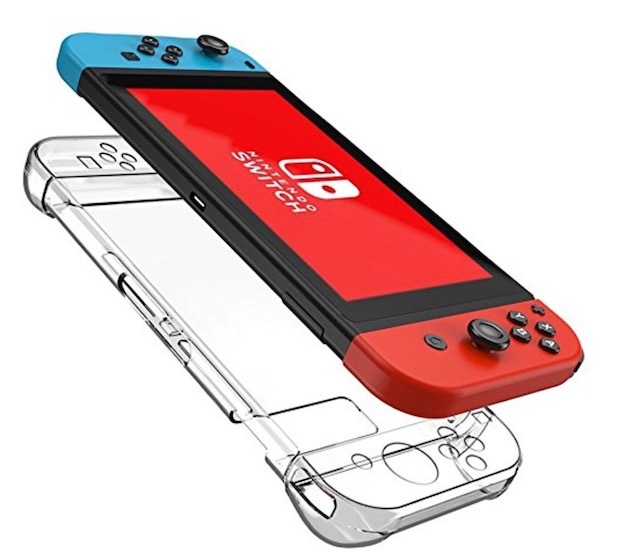 Like every clear case before, it also comes with the 3-part design allowing you to detach the Joy-Cons without any problem. The case has nothing new to offer and is in line with previous clear cases that we mentioned. You can check it out before making a purchase. The last case on the list is different from all the other cases mentioned on this list. This is because the case is made using PC shell along with aluminium sheets which can provide extra resistant and protection against drops. 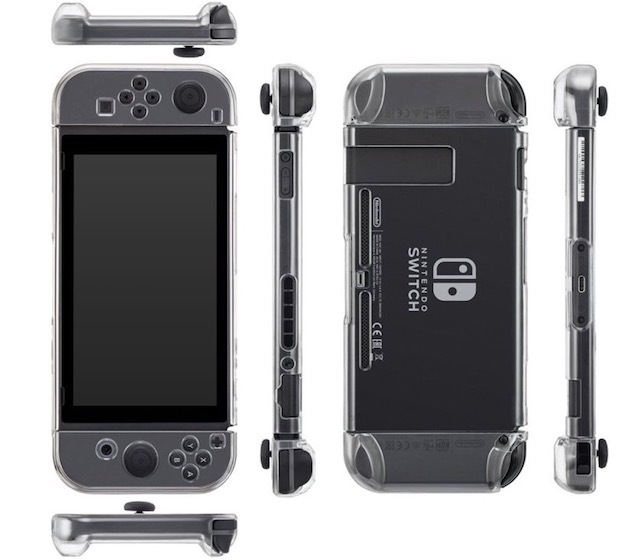 It also sports a 3-section design and has separate cases for the console and the Joy-Cons. The Joy-Cons are protected from all sides as the case also covers the front of Joy-Cons. However, it does leave the area around the Switch’s kick-stand exposed, which can be a cause of concern. However, one thing that really goes in its favour is the colour options. It can give your Switch a unique look which you can deduce from the picture below. It’s a different case and worth checking out. Nintendo Switch is an excellent device, but it’s also a fragile one. I know this because we broke one in our office within one week of buying it. So, take it from me when I say that you need a case for your Switch. Whether you are buying a protective case or a travelling case (I suggest you buy one of each), the cases will help prolong the life of your Switch. You don’t want to break your Switch, especially at the time, when so many cool games are being launched for it. Check out the list and tell us your favourite ones in the comments section below.